Cashmio casino is a relatively new casino which has a lot of promise. So far, they are a high scoring casino at Casinomeister and I’ll tell you why. 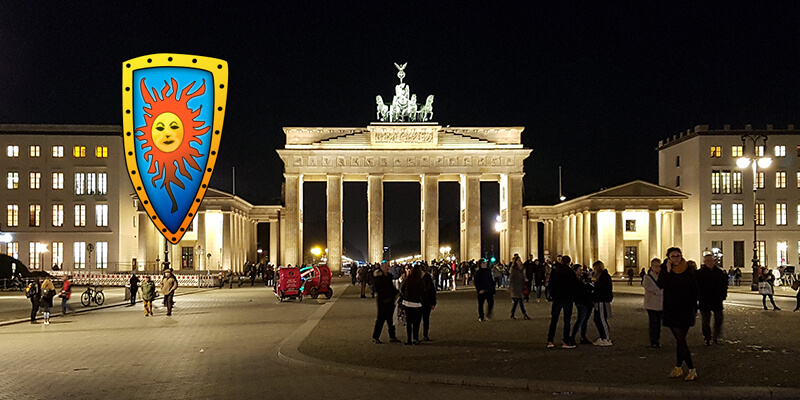 To begin with, Cashmio casino is a publicly traded casino – Gaming innovation Group that includes a number of award winning casinos such as Guts and Rizk casino. They have an awesome software package to include Microgaming, NetEnt, Betsoft, Nyx Interactive, Play’n GO, Williams Interactive, Genesis Gaming, Quickspin, Thunderkick, Scientific Games, ELK, IGT. Their website is easy to navigate, and you can use their search function to search for your favorite games. Unfortunately, you are limited to search only by game – not by game type or game provider. Signing up is easy – it took me about three minutes. What is super player friendly, is that within your account to can choose whether or not you’d like limits for depositing or other aspects of your play. You can even turn off notifications for your phone or email. Depositing was a cinch, which is usual, but making a withdrawal was amazingly fast. My winnings hit my Neteller account within three minutes of my request, and this was my first withdrawal. There are no withdrawal limits – so that is awesome news for high rollers who have massive wins from massive deposits – of even for the occasional lucky low roller. They are licensed in Malta, Sweden and by the UK Gambling Commission. We have had no submitted complaints at Casinomeister – and their Baptism by Fire went by without a hitch. All in all, they are a fantastic choice for players – for the full review, please check out the reviews at Casinomeister’s accredited casinos. 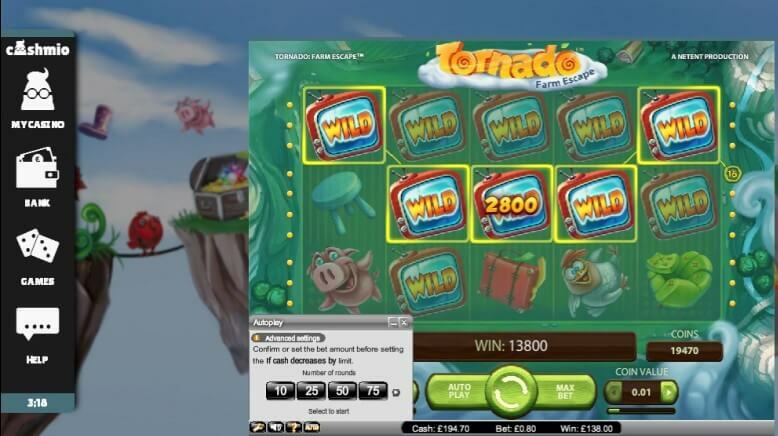 Cashmio Casino is an online casino which requires no download – all of its games can be played in your browser whether it’s a desktop, tablet, or mobile. They are licensed in Malta and by the UKGC. They have a high score at Casinomeister for a number of reasons – one: they are publicly traded owned by Global Innovative Group – the same folks who have been behind the scenes at Guts Casino and Rizk. They are solid and very well managed. The casino is set up to be very player friendly. The payouts are very fast. As I mentioned in my video, my first payout hit my Neteller account in minutes. I was still uploading a copy of my passport when it came in, so someone is on the ball. Winnings are processed on weekends as well, so again – another point added to their score. Further, they have an awesome array of games: Microgaming, NetEnt, Betsoft, Nyx Interactive, Play’n GO, WMS (Williams Interactive), Genesis Gaming, Quickspin, Scientific Games, IGT. 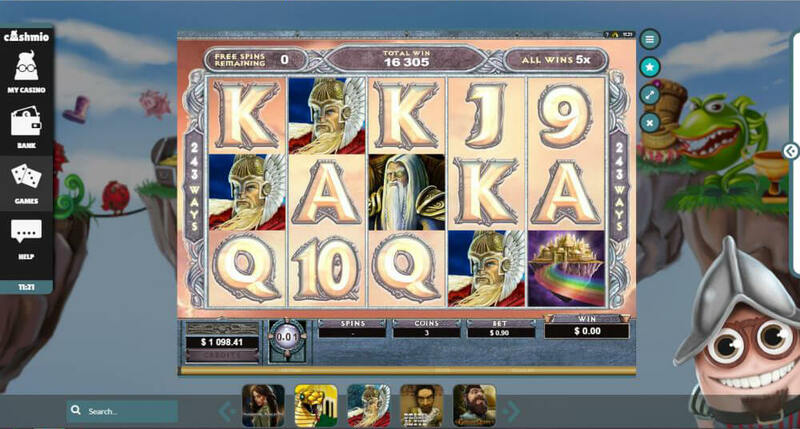 Cashmio also offers games from Aristocrat, Elk Studios, NextGen, Lightning Box, Thunderkick, Bally, Big Time Gaming and Blueprint via NYX platform and Foxium, 2 by 2 games and Barcrest via Quickfire channel. Their Live Casino is powered by Evolution. So there is just about anything for everybody except of course proper video poker casino games. 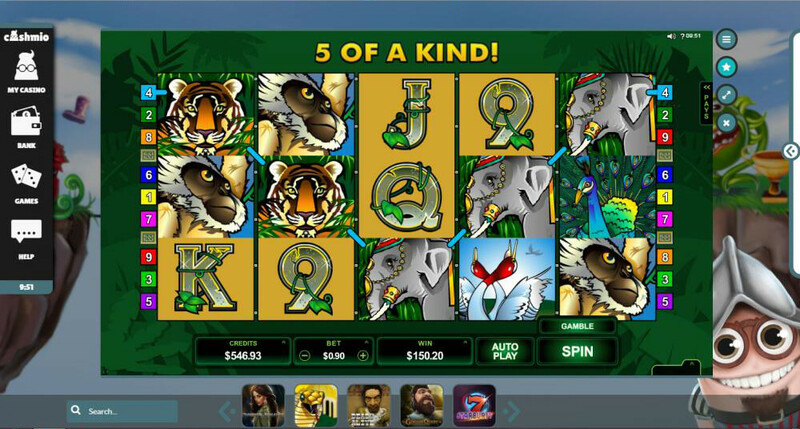 These you will only find on your downloadable Microgaming casinos. Navigation of their site is quite good. You can search for games, but only for the game name – not by software or game type. So that can be improved. They have player safeguards in place so that you can set your deposit limits, loss limits, wagering limits, and session time limits. You can also easily opt out of emails ads and the intrusive SMSs on your phone. Personally, I hate those. 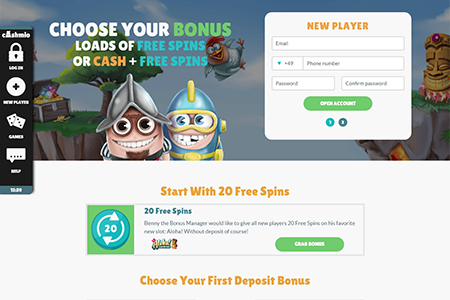 They have two SUBs to choose from: Beside an ongoing no deposit bonus, they offer a 200 Free spins (minimum €20 deposit, or a €50 + 100 free spins offer – minimum €50 deposit. I played without the SUB, perhaps that’s why my payout was so quick. Cashmio has a number of special promos going on their site. One is their “missions”, where you can participate in earning coins by playing certain “missions” which are free spin offers – which are pretty cool. 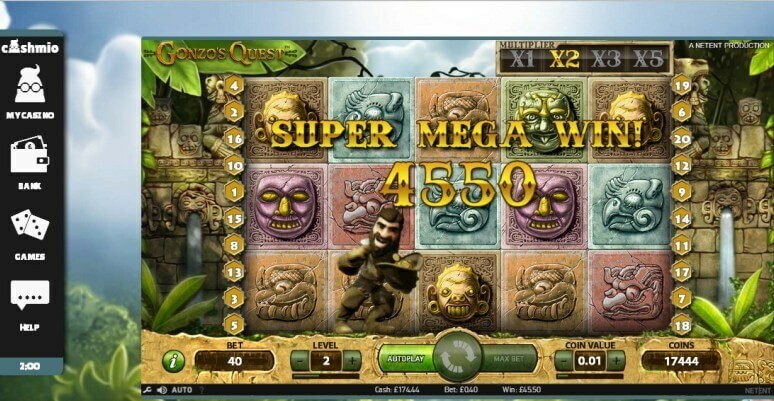 They also have slot tournaments going on – something you can check oout and hopefully get up on their leaderboard. They have one ongoing for low-rollers as well as for high rollers. For winnings of €50,000 and more (excluding progressive jackpot wins), casino reserves the right to divide the payout into 10 installments, paid with 10 percent of the winning sum every month until the full amount is paid out. Data from our Meister Minions. “I think I deposited here 2 or 3 times now. Everything is working as it should. Very nice Site-Layout. I like it alot, that you can check your wagering status with the Game open. Not all Casinos offer this possibility. Then I want to give you a thumbs up for your customer service. Last night I deposited 30€ in order to get the 40FS on Warlords. My deposit was successful but the coin wasn’t activated. So I haded over to the Livechat which wasn’t available. But I used the “leave us a message” – Form and explained my Problem. As I didn’t wanted to wait, I played with the 30€ made some winnings, cashed out most of it, busted with the rest. Cashmio Casino Terms and conditions Apply. Cashmio has the markings of an award winning casino. It’s too early to tell, but let’s hope they keep it together and continue to please players and remain innovative and well managed. They are a player focused – and so far, so good.